I’m not sure if this recipe is a grain bowl or a salad. Maybe that just depends on how you present it? I guess I called it a salad, but I also plated it on a salad plate, so… Regardless of what it’s called, with tender roasted sweet potatoes, chewy farro, garlicky chickpeas and savory minced sun dried tomatoes, a heaping pile of buttery avocado, and a mouth watering lemon vinaigrette this salad-bowl-what have you is so flavorful and satisfying to eat. It’s light enough for spring, but hearty enough for any time of the year. This is a stick to your ribs kind of meal while ticking off so many of those foods you should be eating every day boxes. 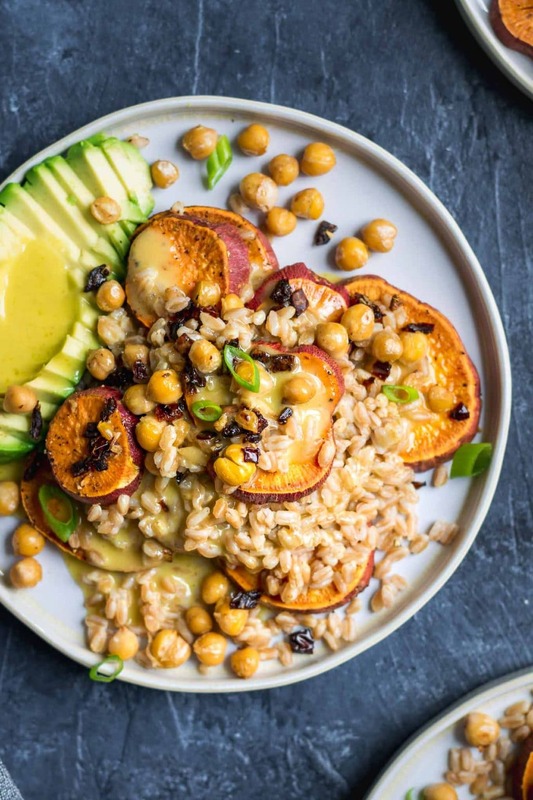 We have whole grains, healthy fats, legumes, and veggies all in one meal. 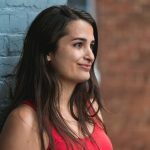 But even if it was the meal equivalent of potato chips I’d still eat it because each bite is just a delicious flavor explosion in your mouth! For the dressing, I made a simple lemony mediterranean vinaigrette. It’s nice and tart with lemon juice, red wine vinegar, and dijon mustard. I balance that acidity with a teeny bit of maple syrup. Like, really a teeny bit. Add more if you want more of that restaurant/store bought style-flavor. Then I’ve spiced it simply with garlic and dried oregano. To make an emulsified dressing I use an immersion blender to blitz everything together, and then while it’s running, slowly drizzle in the olive oil. The more olive oil you add the thicker the dressing and the more mild tasting it will be. An ideal ratio of thickness and flavor for me is to use 3/4 cup of olive oil. You can use anywhere between 1/2 cup and 1 cup though. This recipe does make extra dressing, so you’ll be set on salads for awhile, or not if you’re a dressing fiend! I sliced the unpeeled sweet potato into discs to make a pretty presentation (also, how nice are those purply-red skins??!). It also make it more of a knife and fork kind of meal. Cubing the sweet potato would work nicely as well, and would make the bowl more on the go/work-lunch friendly. The sweet potato is seasoned simply with salt and ground black pepper, then baked until tender and lightly caramelized. Farro is the grain from wheat after it’s been hulled. There are different varieties of farro, including spelt, einkorn, and emmer, and it can be sold pearled, semi-pearled, or unpearled. Pearled refers to the process of polishing the bran off of the grain. This means it has less fiber, a faster cook time, a longer shelf life, and that the grain cooks up more tender. Rice is probably the most familiar example, with white rice being pearled and brown being unpearled. In the stores in the US it’s often not labeled which variety of wheat it is or if it’s polished or not. As such, my cooking instructions work for most of the farro you’ll find in stores here, but check if there are package instructions on how to cook and use those if they differ greatly from mine. Otherwise cook the grain until it is tender but toothsome. It has a similar texture to barley. I cook the farro in broth to infuse it with extra flavor. It can also be cook in salted water (I’d use about 1/2 tsp of salt per 2 cups of water). Lastly make up the garlicky chickpeas! Fry chickpeas until golden, then add minced garlic, minced sun dried tomato and a bit of salt and cook for another minute. Oil packed or dry packed sun dried tomatoes work nicely in this recipe, but if they are dry packed and very dry and brittle rehydrate in some boiling hot water a bit before using. Ideally they’ll still feel supple, as that makes it a lot simpler! I could seriously eat these chickpeas on their own they’re SO good. 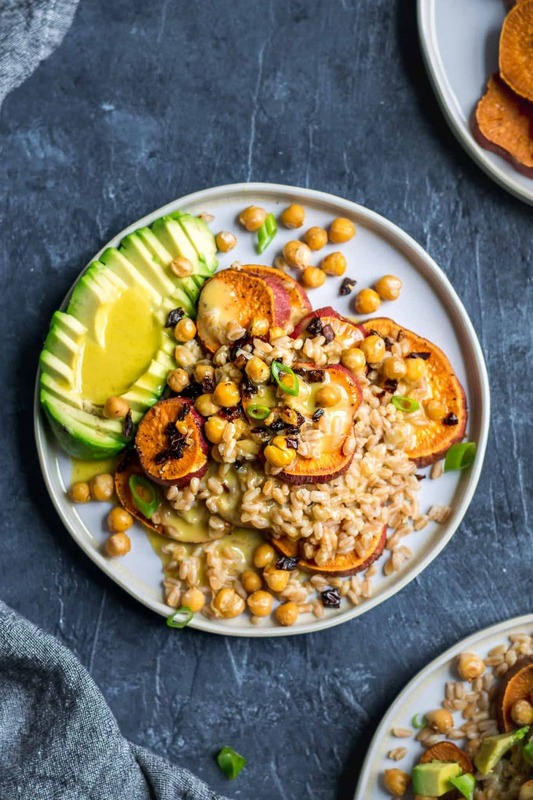 The whole meal is great served warm, with the sweet potatoes hot out of the oven and the farro still steaming. It’s tempered with the cool dressing and creamy avocado. But it’s also great cold or room temperature. It also reheats nicely and makes a great meal-prep type meal. Leftovers are great for lunch! Since there are no tender greens you can dress the salad well in advance. The acidity of the dressing even helps keep the avocado from browning. That being said, I still wouldn’t cut up the avocado more than a day before eating. I hope you enjoy this hearty and wholesome meal! Let me know if you make it! Comment and rate the recipe below and tag recreations @thecuriouschickpea and #thecuriouschickpea on Instagram, or share with me on Facebook! I’ve got more sweet potato inspo where this came from if you’re interested. They’re certainly one of my most frequented veggies! Farro is the grain of wheat and so not gluten free, but you can substitute a different grain for a gluten free meal if you’d like! 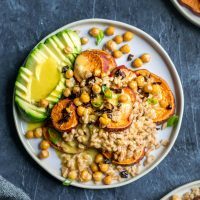 Roasted sweet potatoes are topped with chewy farro and panfried garlicky, sun-dried tomato chickpeas, then dressed with a lemon vinaigrette and finished off with some buttery avocado in this delicious vegan salad which can be served warm or chilled. In a tall measuring cup combine the lemon juice, red wine vinegar, dijon mustard, garlic, oregano, salt, and maple syrup/agave. Blend using an immersion blender until combined, then slowly pour in the olive oil until it's creamy and emulsified. They key is to pour it in a slow drizzle. Set the dressing in the fridge to chill while you prepare the rest of the salad. Preheat the oven to 425 ºF and line a baking tray with parchment. Lightly grease the parchment and arrange the sliced sweet potato in a single layer. 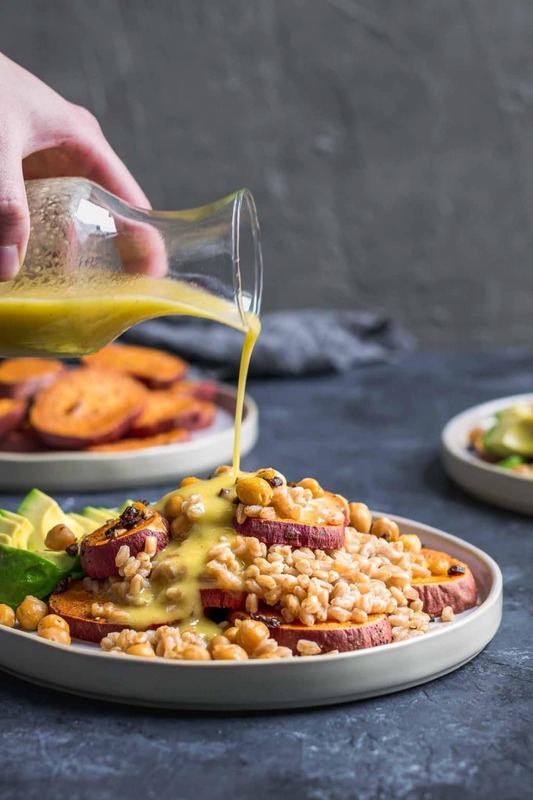 Brush or spray the tops of the sweet potato with some more oil and sprinkle on a little salt and top with lots of freshly ground black pepper. Bake for 10 minutes, flip the slices, then bake an additional 10-12 minutes or until the sweet potatoes are tender and easily pierced with a fork. Heat a large skillet over medium and add 1 tbsp of oil. Add the chickpeas and let them cook for 4-5 minutes, stirring occasionally, until they are lightly golden in spots. Add the minced sun dried tomato, minced garlic, and the 1/4 tsp of salt and cook an additional 1-2 minutes, stirring constantly so the garlic doesn't burn. Turn off the heat. Taste and add more salt if desired. When all parts of the salad are done, assemble! 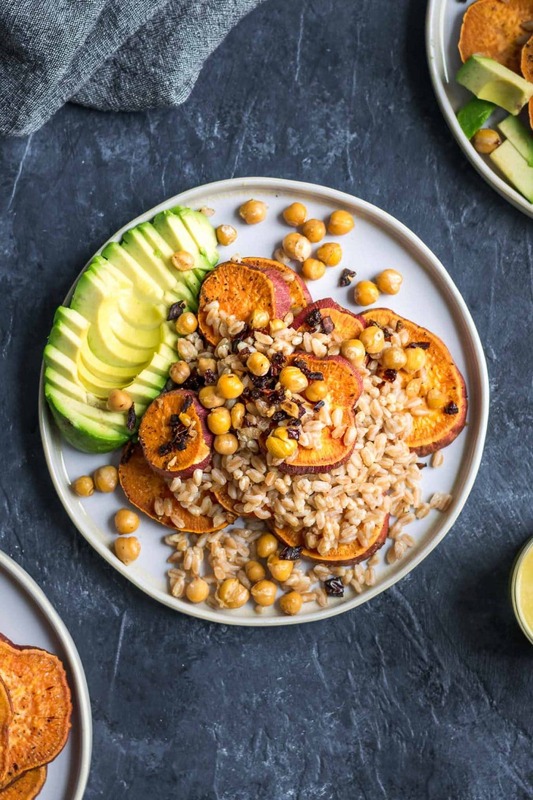 Lay some slices of sweet potato on a plate and top with farro, add a few more slices of sweet potato and another sprinkling of farro. Top with the garlicky chickpeas and sun dried tomatoes and avocado. Garnish with some sliced scallion greens if you'd like, then add dressing to taste and enjoy! Looks absolutely wonderful, and so flavorful!